Navy inspired clothes are always a big trend during summer time, striped tops and navy skirts making the perfect combination for a day at the seaside. So perfect that in become some sort of a cliche seaside outfit. That's why, even though i like to dress like a sailor, i try to look beside the obvious white/blue/red or white/blue/gold color schemes in stripes or blocks, and find more subtle navy inspired items. Marc Jacobs' bold printed logo at a closer view cannot be categorized as navy, but from a little far behind the red, white and blue letters are a nice navy pattern. 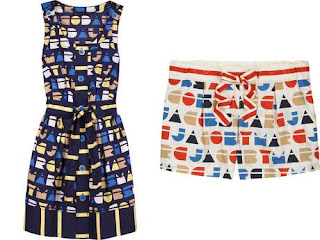 Same goes for the summer dress, where the yellow, blue and navy creates the perfect contrast. Among college inspired clothes, Juicy Couture offers some navy as well. 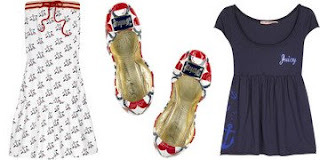 The anchor printed strapless dress is just navy-perfect, and i also like the Rory banana flats and the anchor printed babydoll in dark navy.